Registration of marriage in Thailand can only be done at a District Office (“amphur”), which is similar to a town hall in Denmark. Please note that a marriage ceremony performed in a church, or in a mosque, or a ceremony at home with monks attending the wedding is not legally binding in Thailand – and therefore not legally binding in Denmark either. 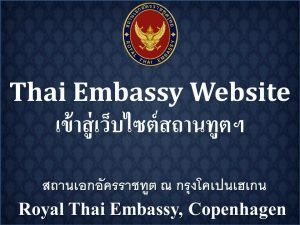 In order for a Danish citizen to register marriage in Thailand, the Thai authorities request that the Danish Embassy issue a letter in English and Thai, which confirms the Danish national’s name, nationality, passport number, issuing passport authority, address in Denmark, employer, position, and salary. Furthermore, names and year and date of birth of children under 18 from previous relationships, and finally, names and addresses of 2 contact persons (references) in Denmark, who are not family, should also be included in the Embassy’s certificate. The Embassy would like to stress that it is not necessary to hire a Thai agency or lawyer in order to get married in Thailand. When you return to Denmark after having registered your marriage in Thailand, you should inform the municipality where you live (Folkeregisteret) about your marriage. Complete the “Information sheet for registration of marriage in Thailand” (in Danish). Click here. Save and print the form. Salary statement (the latest) or similar documentation of your income, for instance your pension statement or your yearly salary statement from the Danish tax authorities (årsopgørelse). Documentation of name and address of employer and your title (if you hold a job). Names and addresses of two persons you know in Denmark, who are not your family. Names and date of birth of your children under the age of 18, if any. Certificate from your Danish municipality concerning notification of marriage (“Ægteskabsattest” NOT “Bopælsattest”). You may find the requisite form (Notice of Marriage) which you need to fill in here. Do not forget to inform the municipality to which address you want the “Marriage Declaration/Ægteskabsattest” sent. Kindly note, that you must bring and show the original documents when you come to the Embassy to pick up your certificate for registration of marriage in Thailand. If you prefer to have the certificate sent to you by postal mail or picked up by a messenger, (who will need a power of attorney from you), this is possible, but we will still need to see the original documents. Under normal circumstances, it takes 2-3 working days for the Embassy to issue a certificate for registration of marriage in Thailand. You will be charged a fee for the Embassy’s assistance (See: “Fees“). Normally we require cash payment when the certificate is picked up. In cases where we are requested to send the certificate, we will enclose an invoice. 2. 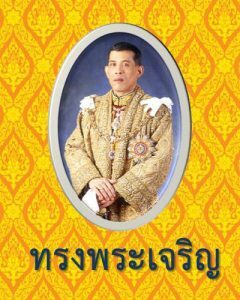 You should bring the certificate to the Thai Ministry of Foreign Affairs to be verified as a true document issued by the Royal Danish Embassy. It usually takes a couple of days for the Ministry to verify a document. Please note that the Ministry will charge you a fee. The Danish Embassy cannot assist you in having the certificate verified by the Thai Ministry of Foreign Affairs. It is possible for foreigners to forward documents for legalization by mail directly to the Royal Thai Ministry of Foreign Affairs, Legalisation Division, cf. the following link. 3. When the certificate has been verified, you may register marriage at any District Office (amphur). The Embassy usually recommends that you register marriage in Bangkok*, or in another larger city, as the district offices in the cities are more familiar with the embassies’ certificates. You do not need to make an appointment in advance with the District Office. The amphur will charge you a small fee for the registration of marriage. Please note that you might also have to pay a small fee to the two marriage witnesses, if they are provided by the amphur. 4. After your marriage you may inform the Danish authorities (Folkeregisteret) of your changed civil status. For that purpose you need to have your marriage certificate translated to English by a translation agency and then legalised by the Embassy. Giftermål i Thailand skal indgås på et lokalt distriktskontor (“amphur”), hvilket svarer til et dansk rådhus. En vielse i en kirke, en moské eller ved en munkeceremoni er ikke retsgyldig i Thailand og dermed heller ikke i Danmark. 1. Udfylde ambassadens oplysningsskema til brug for indgåelse af ægteskab i Thailand. Klik her for at åbne skemaet. 2. Kontakte din hjemkommune i Danmark (seneste hjemkommune, hvis du er bosat i udlandet) med henblik på at få udstedt en ægteskabsattest. Erklæringen skal udfyldes og underskrives af dig og din kommende ægtefælle og indsendes til din seneste hjemkommune vedlagt de i vejledningen nævnte bilag. Klik her for at finde blanketten. Husk at oplyse kommunen om den adresse, du ønsker ægteskabsattesten sendt til. For at spare tid her i Bangkok er du velkommen til forinden at sende dokumenterne til os i kopi (pr. brev, fax eller mail), og først forevise de originale dokumenter, når du afhenter ambassadens attest her. Ambassaden opkræver gebyr for udstedelse af attesten, jfr.”gebyrer“. Husk at gebyret skal betales kontant i thailandske Baht. C. Herefter kan du og din kæreste blive gift på et hvilket som helst distriktskontor (“amphur”). Ambassaden plejer dog at anbefale, at man bliver gift i Bangkok eller i de større byer, da distriktskontorerne her er bedre kendt med ambassadernes attester. Der skal ikke bestilles tid i forvejen. D. Husk efterfølgende at indberette giftermålet til folkeregisteret i din hjemkommune i Danmark. 2. og derefter skal ægtheden af det thailandske udenrigsministeriums underskrift bekræftes af ambassaden. For legaliseringen betales et gebyr .